I wrote a little about Winx Club, the 2004 Italian cartoon, in my "Faery Princesses" and "Magical Girls" posts, but I had only seen the first two seasons at the time. Not only that, but I saw the second season over a decade after watching the first. As it turns out, the show has aired seven seasons over the past 13 years, so maybe I wasn't being fair to write about it after having seen so little. I decided to binge everything I had missed to find out. When I started to navigate how to go about watching the later seasons, I discovered that the show was a bit of a mess. There are three different English dubs, and it switched networks several times, with years between some of the seasons. It's no wonder I lost track of it. Was it worth making up for all that lost time? Here's what I discovered. Shows that run for longer than five seasons tend to come up with some absurd ideas toward the end to keep things going. Just look at the ridiculous concepts Once Upon a Time is trying with its upcoming seventh season. 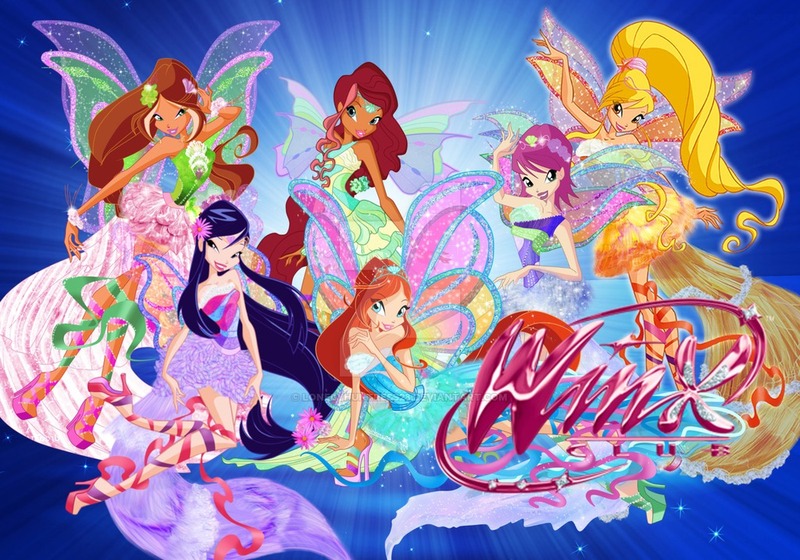 Fortunately, Winx stayed pretty strong for most of its later seasons. Instead of making up story arcs that didn't make sense, they stuck to exploring more of the kingdoms where the fairies came from and expanding upon ideas that were introduced in earlier seasons. For instance, Bloom didn't find out if her parents were still alive until a movie special that took place after the third season. Then, her sister, Daphne, showed up as a ghost-like spirit at the beginning of the series, and they didn't figure out why or how to return her back to normal until the end of the fifth season. Aisha (Layla in the earlier seasons), who quickly became a very important character, wasn't even introduced until the second season. Having six girls from six different planets also gave the writers lots of new places to visit that didn't feel shoehorned in. Of course, taking so many years to reach these developments would have probably been torturous to watch from week to week with over a year between seasons. I think I was able to enjoy it a lot more because I binged it years later. One thing that I found a bit annoying in my binge session was that they defeated the Trix at the end of every season and found a way to lock them away "forever," but they kept bouncing right back at the beginning of the subsequent season, more powerful than before. The fairies also got new wings and transformations every season, which I suppose is to be expected for a magical girl show that kept needing to sell new dolls. For the most part, the ever changing costumes didn't bother me nearly as much as I thought they would, but I did like some of them a lot better than others. 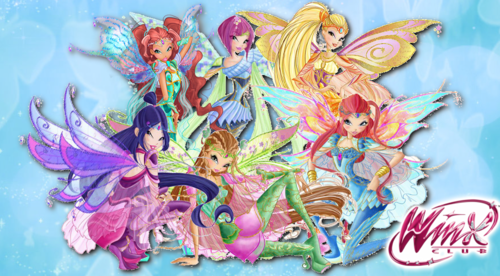 My favorite costume designs were the Harmonix (pictured above) from the fifth season, and my favorite wing designs were the Bloomix (pictured below) from the sixth season. The concept of tacking an "X" onto everything in order to make it a fairy word was kind of silly, though. In truth, I was vaguely aware that the show was still running sometime around 2011 when I caught part of the Magical Adventure movie special on Nickelodeon. However, I was so put off by the hideous CGI animation that I had absolutely no interest in catching up with it at the time. Thankfully, it turned out that the uglymation was only used for the movie specials and a very small unwatchable portion of the later seasons. I'm not quite praising the show's regular art style, either. It's rather bland with anorexic-looking characters who all have the same bodies and faces, but it still works better than the same style in CGI. I am, however, a fan of the animated glitter on their wings, which improved with each passing season. The character designs seem to have changed very little over the past 13 years. Bloom's hair got flatter, and Aisha's hair got bigger, but that's about it. Stella became obsessed with changing everyone's outfits every five minutes in the later seasons, which was nice because it gets boring to see the same ones all the time. Personally, I think that the story peaked around the fourth or fifth season. The first three seasons followed the girls' time studying magic at Alfea College and their adventures along the way. It wasn't until after their graduation (which sadly happened in one of the awful CGI movies instead of a regular episode) that we got to really know their lives and their home worlds. Stella's kingdom of Solaria was explored a little earlier in the third season when her father was cursed, ruining the royal ball in her honor. The fourth season explored the idea of bringing magic to Earth and gaining power from humans' belief in fairies. It also introduced a new character, Roxy, the last fairy on Earth. My favorite kingdom was Aisha's home world of Andros because it was full of mermaids. The underwater scenery was breathtaking, and the designs for the selkies, who looked like mermaid pixies, was very unique. It was interesting to see how differently the mermaids ran their kingdom from the humans. I did think it was weird that Aisha and her parents were human when her uncle and cousins were mermen, and there did not seem to be any other humans in her home world. I might get some flack for this, but I thought Winx Club did a better job of making their cast diverse than Sailor Moon, which had a similarly large cast of magical girls. The fact that each fairy's talent also represented their personality made it very easy to tell their mentalities apart without having to read into the dialogue too much. Bloom was a feisty and stubborn leader, Tecna was smart and introverted, Stella was vain and obsessed with clothes, Flora was warm and nurturing, Musa was modern and hip, and Aisha was athletic and energetic. Many of their relationships felt shoehorned in, but I liked that they didn't all get boyfriends in the first season. I also liked that Musa and Riven were constantly having problems because, well, he was kind of a jerk. It wouldn't have been right to make it look like their relationship magically erased all of his flaws. I'm glad she broke up with him later on and focused more on herself. The most interesting guy in the show was Aisha's love interest, Nabu, who they had to go and kill off like a bunch of jerks. Nope, I'm never going to live that one down. When I got the seventh and final season, I realized that YouTube didn't have every episode. Then, I saw the Butterflix transformation and the ridiculous simultaneously choreographed line dance that the girls did after every transformation. Suddenly, I was okay with not being able to watch the whole thing. The seventh season also introduced time travel. When a show brings in time travel, you know they've truly run out of ideas. I hate to bring up Once Upon a Time again, so I won't. As far as I'm concerned, the main show ended after season six, when Bloom's family was reunited and her sister got married and was crowned heir to the throne of Domino. Overall, I'm glad I caught up with most of the seasons I'd missed because it was very interesting to explore the worlds where the girls came from. In the first season, I was under the impression that they were all princesses, but it turns out it's only half the cast. That's a shame because I think Flora, Tecna, and Musa would all make fantastic princesses. I loved seeing all their glittery new wings and learning more about where Bloom came from. She's basically the Superman of fairies, having been raised on Earth. The only things I could have done without were the tacky CGI specials and add-ons in the later seasons. If you're like me and only saw the Alfea seasons of the show, I'd definitely recommended giving seasons four through six a whirl. I, as all and sundry know, adore Winx Club mostly because it's such a perfect vessel for fandom. The many characters, the worldbuilding that leaves scraps lying around, the endless costumes perfect for drawing. It's not a perfect story by any stretch, but it's perfect for doing things with. I must admit however that there are many dumb things scattered throughout my beloved show... and the Butterflix dance is one of them! Good grief is is stupid to dance while preparing for battle! Don't let that put you off watching season seven though-- I liked it better than the previous two seasons, despite the silly dance routine. There was alsio a third movie, Mystery of the Abyss. If you thought the first two movie had bad animation, well the third movie's is much, much worse. Much. I'm hoping the movies redeem themselves when movie 4 inevitably appears since I really loved the first two. The spinoff World of Winx, which is on Netflix, is visually gorgeous and a whole lot of fun, if you ignore the normal ammount of plotholes and the problematic side effect of the evolving art style that made Flora's skin much paler. I read about Mystery of the Abyss in my research, but I was too terrified to watch it after seeing the other two. The two dubs of Magical Adventure made it seem like two completely different movies, but they were both terrible! As far as the dance, I thought it was particularly stupid that they all did it together and then immediately acted like absolutely nothing had happened. Winx Club will always have a special place in my heart but I feel like its magic has long been lost.I think it would had been best if Winx Club had ended at season 3 or 4 where it still was at its peek because after that the quality of animation and writing just went down. I saw the teaser for season 8 and it kinda looks like they're making a soft reboot of how young the girls look, especially the Specialist, they all got squared down!